As population struggles with addiction and substance dependence as well as depression, fragmented care puts health care professionals at a disadvantage. In the U.S., historically we have separated out mental and behavioral illnesses from physical illness. What we are learning – at a pretty high cost – is that having two separate and unequal systems of care results in suboptimal treatment of a patient. Keeping mental and behavioral health services apart from physical health services is not working, according to results from the latest NEJM Catalyst Insights Council Report on “Mental and Behavioral Health Integration into Care Delivery.” Just over half of survey respondents call their organization’s mental and behavioral services “not very adequate” or “not at all adequate” to meet the needs of the patient population. “In the U.S., historically we have separated out mental and behavioral illnesses from physical illness. What we are learning – at a pretty high cost – is that having two separate and unequal systems of care results in suboptimal treatment of a patient,” says Amy Compton-Phillips, MD, Executive Vice President and Chief Clinical Officer for Providence St. Joseph Health and theme leader for NEJM Catalyst’s Care Redesign sector. The predominate mental and behavioral health services provided at organizations today are basic screening (77%), psychiatric medication (66%), and psychological counseling (62%). Addiction and dependence is seen as the most pressing cause of mental and behavioral issues, according to 72% of respondents, with depression (59%) and adverse social circumstances (39%) rounding out the top three. Respondents say absent or inadequate insurance coverage, fragmentation of care, and lack of access to specialty care rank about equal as the most pressing barriers to delivering mental and behavioral health services. 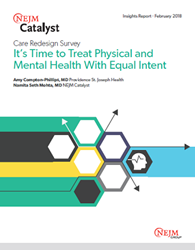 For more on the NEJM Catalyst Insights Report on Care Redesign, visit: https://catalyst.nejm.org/time-treat-mental-and-behavioral-health-equal-intent/. An index of all NEJM Catalyst Insights Reports can be found here: https://catalyst.nejm.org/insights/.